The community a brewery can create is strong – so strong that it can unite unlikely people together. But, what if the community was already there, and helped build the brewery? 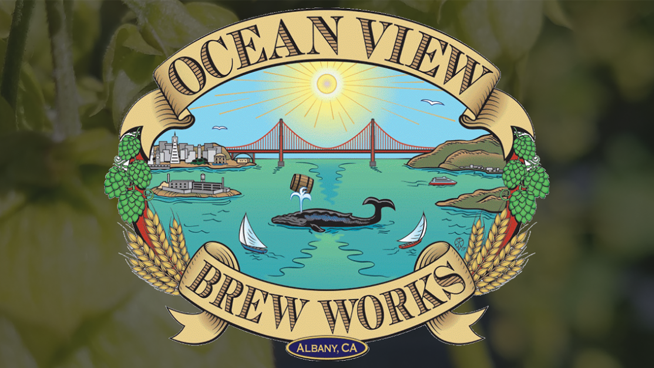 Here starts the story of Ocean Views Brew Works in Albany. With just a little over a year under their belt, the husband and wife team known as Scott and Vonnie Davidson are a prime example of when a community comes together to help build the institution. From those who willingly come to host trivia or bingo nights, to the handmade bar top in the tap room, Ocean View Brew Works is all about community. You might not be able to find Ocean View on tap just yet but you can find them at the local East Bay farmers market. For the community, by the community; Ocean View believes strongly in giving back – so much that they donate their spent grain to the UC Berkeley Botanical Gardens to be added to their mulch for fertilizer. Aside from the strong community drive, what makes this story that much more lovable is that Vonnie didn’t let Scott giving up on his dream of brewing. Upon the birth of their first son, Scott was about to hang it all up and focus on raising a family. Vonnie instantly shut that idea down saying that it would be a ridiculous idea and continued to run her tutoring company while Scott, who had many odd jobs, continued to push forward with brewing. As she states – he had two passions, his guitar and brewing. So it was only natural for them to finally embrace the idea year later and build a space that the community can enjoy and showcase Scott’s craft. The taproom is a nice and cozy gathering space that boasts that it is both kid and dog friendly. Which, it actually is very kid friendly and even has a whole dedicated area, full of toys and games for kids (from infants to toddlers) to enjoy. For food, definitely take a look at their calendar to see what food pop-ups will be at the taproom. When I came through they had a Spam pop-up which smelled ah-mazing! As Ocean View Brew Works starts to grow, they’ll soon be selling their beer out to other taprooms – but in the meantime, don’t be afraid to stop by and grab a to go crowler. Come for the beer, stay for the community.